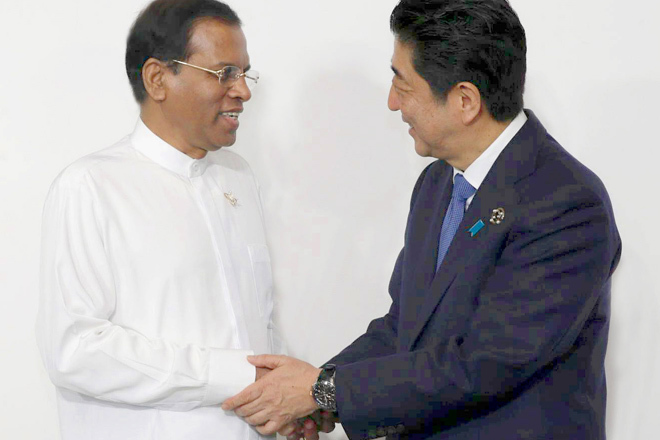 May 28, 2016 (LBO) – Japanese Prime Minister has offered a 38 billion yen (USD344 million) development assistance loan to Sri Lanka for water purification projects for Kidney diseases and establishment of electricity transmission lines connecting the entire country. Prime Minister Abe has also thanked President Sirisena for raising Asia’s voice and explaining the Asian perspective to the Western nations at the G 7 Outreach Summit in Ise Shima in Japan. Considering the fact Sri Lanka is strategically located in the Indian Ocean, both leaders shared the view that the development of the country and strengthening regional connectivity are of critical importance to the prosperity of the entire region, a statement said. They reaffirmed need to strengthen cooperation for the implementation of the Comprehensive Partnership between Japan and Sri Lanka and the Partnership for Quality Infrastructure. Both leaders recognized the importance of the ongoing national reconciliation process in Sri Lanka, and welcomed the exchange of notes regarding the establishment of research and training Complex at the Faculty of Agriculture, University of Jaffna (worth approximately 1.7 billion yen) on 18th May.